These Roto molded plastic kid’s bumper cars have no motors or batteries but are propelled by simply turning the steering wheel from left to right. 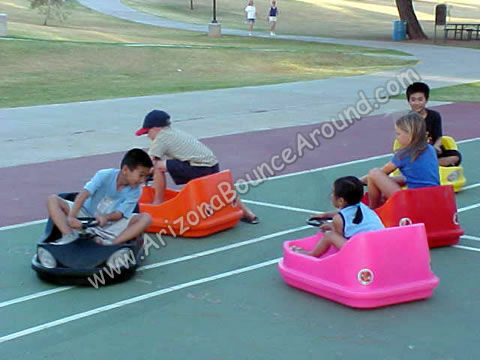 These bumper cars are light weight, easy to use and are a must have for any kids party, school carnival or special event. Are you kidding? Kids bumper car rentals in Colorado for only $195.00 for 5 bumper cars? That’s right; you can have bumper cars at your party or event and turn the gym, basketball court or cul-de-sac into a bumper car arena. Our bumper car rentals come complete with 4 orange cones to make a barrier for the bumper cars but you really don’t even need them because all the kids are trying to hit each other. 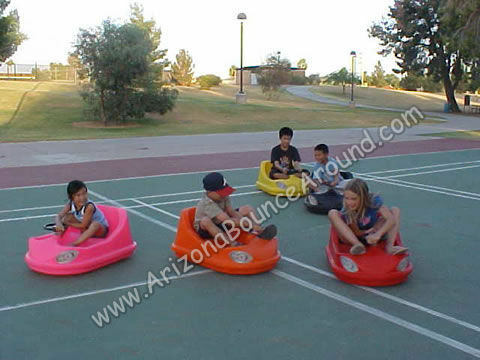 We also have a really cool inflatable race track that would go great with these bumper cars. This is a super fun easy party or carnival game to add to your list of must have activities for children.